I’m using this Stillio Pricing Guide page to report on real discount coupon codes and teach you how to find promotions like 20% off for the whole year. Automatic website screenshots made easy & fun. Check these first for active promotions & or read more below! When you decide to subscribe we have a special discount for newsletter members. With this coupon you will get a 20% discount for the first 12 months of your subscription. The coupon code is valid until June 15 2017 (read campaign info). There are several possible ways to find discounts (& I encourage to avoid fake coupon sites); if you have time to wait I would suggest to signup for their newsletter which will publish most of the active promotions directly to your inbox. Anyone can easily start a free 14 day trial through this link — and best of all no credit card is required for the sign up. If you decide to continue with the automatic screenshot service; you can choose between automatic monthly (or yearly for added discount) billing or payment on a month-by-month basis so that you can decide on each month separately. Pricing is based on a “pay-per-screenshot” policy where you charge your account with a minimum of 3USD and only pay for used up screenshots. If any deposited funds are left over it will be carried over to the next month and so on. Note: Stillio uses Stripe to process payments; all major credit cards accepted. Now it’s easier than ever to capture website screenshots automatically. 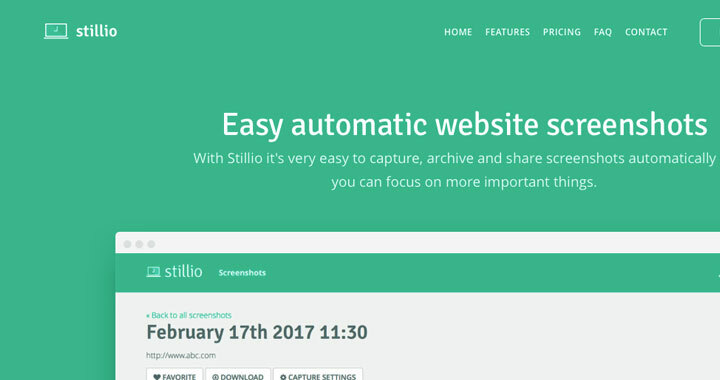 With Stillio you can set the capture frequency to every hour, day, week or month. Just input the frequency and you’re all set. So whether you want to track one webpage every 5 minutes, or hundreds of pages every 2 weeks, they’ve got you covered! New feature! Custom screenshot frequencies; every hour, day, week or month. Tips, questions, comments are welcome below!